On Saturday 3rd November, Ireland’s best-known broadcaster, Pat Kenny addressed a crowded Ardgillan Castle at the launch of perhaps the most visually-attractive book published so far this year. Special guests were Terence Taylour, of the family that resided in Ardgillan from the time it was built in 1738, and his wife Lindy. They returned to the former family home on the evening to celebrate the launch of the book and chatted amiably with all of the guests. Pat Kenny was effusive in his praise of the book and said that it highlighted Ardgillan as a unique attraction in a particularly dramatic landscape and described the publication as “a masterpiece of photography and story-telling”. He emphasised the importance of preserving the Castle as a fine example of the precious built heritage that we in Ireland are privileged to have and welcomed the book as an important initiative in respecting our history and traditions. Author Aidan Herron, himself a guide at the Castle, then explained that the book originated as a series of articles called Hidden Gems of Ardgillan Castle that appeared in The Skerries News. Now extensively reworked, and with additional material included, the articles now appear in one handsome volume. The book brings the past to life as experienced both ‘upstairs’ and ‘downstairs’ in a Big House. Herron observed that Ardgillan is a unique place with unique attractions and that people need to see that the castle is more than just a panoramic setting. He went on to praise his colleague Eamon O’Daly’s sublime photographs for showing Ardgillan in all its former, poignant grandeur. He thanked Fingal County Council for its financial support in allowing this publication to happen. Today Ardgillan is in the hands Fingal County Council which, with great foresight, purchased it in 1982, and then opened it to the public. It is now one of the most popular venues for visitors in North County Dublin. 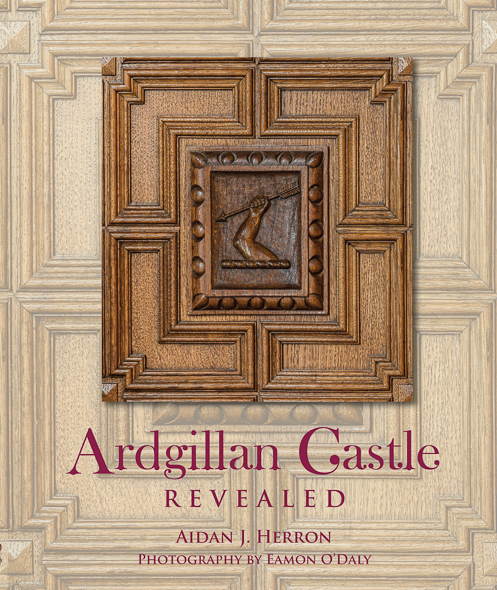 However, the title of the book Ardgillan Castle Revealed is significant, as Herron explained, since many of the splendid treasures and collections that reside in the House are currently not on view to the public. The entire proceeds of this publication will be donated to the Board of Ardgillan to kick start the process of developing specific heritage projects, however small, that will allow the public to view these valuable artefacts during guided tours of the Castle.